Today, 2 December 1914, was George Calderon’s forty-sixth birthday. He most likely celebrated it over tea with Kittie and his mother; possibly a sister or brother also looked in. His mother, Clara Calderon (1836-1921), was the sister of painter George Adolphus Storey, and a Victorian superwoman. 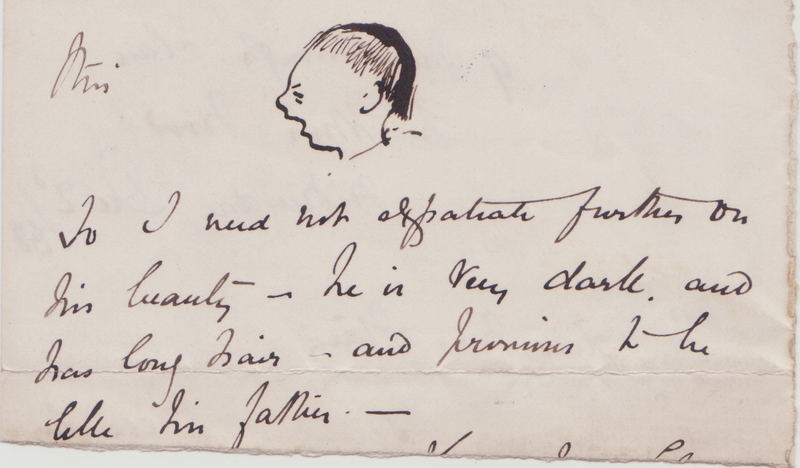 ‘I need not expatiate further on his beauty’, wrote Calderon père, ‘ — he is very dark, and has long hair — and promises to be like his father.’ What this does not explain is the thick black line he has drawn down the top and back of George’s infant head. This is clearly different from the actual hair, so it seems most likely it was part of the caul, i.e. foetal membrane. In Russian superstition, to be born ‘in the caul’ (v rubashke) was very lucky! However, on War Office Form M.T. 393, which George completed at about this time ‘For Appointment to a Temporary Commission in the Regular Army for the Period of the War’, it was precisely the year of his birth that was underlined half a dozen times in pencil by the recruitment officer. This entry was posted in George Calderon, Timeline and tagged biography, Clara Calderon, Clara Storey, George Adolphus Storey, George Calderon, Kittie Calderon, Philip Hermogenes Calderon, St John's Wood Clique. Bookmark the permalink.